Dr. Eric S. Waldman was born in Queens, NY. He attended University of Buffalo in Buffalo, NY and following graduation he attended Tufts University School of Dental Medicine. After earning his DMD degree, Dr. Waldman completed a General Practice Residency at the Mount Sinai Hospital in New York city. Dr Waldman then entered into private practice in 1996. 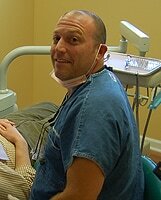 He has been practicing at Dolson Avenue Dental since 2003. As a dedicated husband and father of five, Dr. Waldman has many interests outside of dentistry. He enjoys jogging, weight training, Giants football, Yankee baseball and spending time with family.